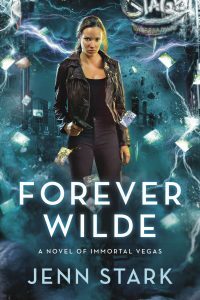 Jenn Stark - Urban Fantasy and Paranormal Romance » Cover Reveal – Forever Wilde! Cover Reveal – Forever Wilde! Special thanks to One Book Two for hosting me with a cover reveal for FOREVER WILDE! I’m delighted to share it with the world! It will be added to retail sites over the next few days, but the book is now available for preorder at Nook, Kobo, iBooks and Amazon. I have just finished reading the series, can’t wait for the next. Love these books. Thanks, Susan! I’m so glad you’re enjoying the books and are ready for Sara’s newest adventure! I truly hope you enjoy FOREVER WILDE as well. 🙂 Thank you for reading! Thank you so much for writing this series! I just finished reading it and now can’t wait until the next one! Just out of curiosity, how many books would there be in the series? The story is so gripping and such lovely characters! Thank you!! I am planning four more books in the series in 2017, depending on reader interest. I’ll keep writing Sara’s adventures for as long as readers would like to read them. She always has another card up her sleeve! I can’t tell you how much I love this series. It may be the best fantasy I’ve ever read, and I’ve read a lot. T annith Lee, Lord Dunsany, H. Warner Munn, didn’t thrill me as much as this does. John, thank you! I’m honored to be listed as a peer among such classic authors of Fantasy and I’m beyond thrilled that you’re enjoying the Immortal Vegas series. I’m looking forward to the next twist that WILDE CHILD will bring to Sara’s adventures! I love these books. Often I start a series and get a bit bored with the theme after a bit.. That being said, I can’t set my kindle aside. The dishes don’t get done, sewing projects don’t get finished etc. Looking forward to the next one when it comes to be. Your characters pull me along for the ride and what a ride it is! Gale, thank you so much for reading the series and for letting me know that you are enjoying the stories!! Posts like these make me tear up–I have so enjoyed writing these stories and I’m blessed to be able to continue to do so because of readers like you. Here’s wishing you a fabulous New Year! I read a lot. in today’s writers I find the character growth to be stunted, your told not shown. Your stories show you the behaviors and you get to choose how you feel about them. Your invited into a world that is diverse, fun and still evolving. I’m really looking forward to the next chapter in your alternate reality. Your chacters are intriguing, your stories draw one in and it gets harder to not read one of the Sara Wilde books at one setting. Please write more Imortal Vegas novels. Many authors have dropped out of writing in the last few yers due to the inability to make a living with it. GH, thanks for your post! I definitely have more Wilde books up my sleeve–starting with WILDE CHILDE, coming this May. I’m so very grateful for readers like you who are enjoying the series, and I sincerely hope you enjoy the coming books as well. Thank you again for taking the time to write!